Usually this website is about dyslexia and hyperlexia. This is a diversion – report on my 2010 Olympic trip – to Vancouver. Day eight, Feb 17th, last day. I am sitting at the airport, gone through security – more thorough these days – had to open my computer and turn it on. That hasn’t happened for a cat’s age. And I have gone through customs. No line. Now I have my Starbucks cup of chai tea and a muffin from Mum’s on Denman and am sitting at a long counter with huge windows in front of me giving me a spectacular view of the Coast Range Mountain. Tucked behind them is snow-capped Whistler. It’s a beautiful twilight. Word has it that this coming week there will be sunny weather. I am so glad for all the visitors – they need a break from rain. Guess what, I lost my umbrella yesterday! Riding on the subway to the airport I sat next to a woman coming to meet her brother coming for the Olympics. One thing led to another and we ended up on the topic of security. She commented: I worked at Expo 67 in Montreal – we had none of this intense security. Well, said I. So did I work there and we were off and running on many topics. She worked in the office at Ile de Cite – sp? And of course, had a great time. This caused me to share with her an ah ha I had yesterday. One of the reasons these Olympics seem so much fun for me comes in part from the fact that I was never a “tourist” at Expo 67 or 86. I was too busy working and occasionally dashing to see a Pavilion when I could squeeze it in. Now, I have the privilege of seeing the results of so many other people’s hard labor. They have done a fabulous job. By the way, I meant to tell you about Jap a Dog. The other day on the bus I passed a hot dog stand with a line that was a block long. Four people were feverously selling hot dogs. The bus moved on. A few blocks later I saw the same thing and it was then that I grabbed the name. Jap a Dog. This street side concession is very popular in VCR. And, not all the patrons were Asian. Wonder if this is anywhere else? I did have one disappointment today. I wanted to buy a pair of the Olympic mittens – they are bright red and adorable. It turns out that Vannoc gave the concession to two large retailers: Zellers and Hudson’s Bay. There’s no Zeller’s downtown so I high tailed it to the Bay. Can you believe there was a line that would take me and hour and half to go through to buy a pair of mittens? You are right, I didn’t do it. Isn’t odd that Vannoc didn’t want their merchandize sold all over the City!!!! I was on my way to have lunch with Rae Ackerman – a former Expo 67 colleague who now manages all the Civic Theatres. I was early so I jumped into a bar to see what sport was happening and to be viewed on a big screen. Women’s down hill. Oh my God, did you watch? They go at a speed that’s terrifying. But with the sun out and the blue and green mountains in the background juxtaposed again the white snow with those strange watery blue lines to give the skier a sense of where she is and then the skier in her outfit – the sheer beauty of it all took over. I sat with two guys who kept their eye on the stop watch – Hey, one would say – she’s losing time or look at that, she’s under. And, then together the three of us would hoop and holler. Hey, Mam, won’t you have a beer. Sorry, no. I am going to a meeting at noon. And, soon I left them. They were good company. Rae bought me lunch – delicious ribs and stuffed potato. I cleaned my plate. There is something about the Olympics. I eat and don’t seem to gain. I like that. I did go back to the Ontario Pavilion – had heard the film was worth seeing. Well, it was okay – would give it a six. It’s 4-D. If you haven’t seen a 4-D film yes, go. Otherwise, it’s a pass. There is a half- hour line. I was glad, however, to go back by GM Place area– for the crowds were energized – half of them were exiting after a hockey game (Finland versus Belarus). You probably know Finland won. And, then half the crowd was just about to enter for the next hockey game. It’s that kind of energy that is fun to be around. And, then it was time to get back to Katherine’s, grab my luggage and head for the airport. PS. Those of you in Vancouver or coming: don’t forget the short train ride from the Athletes Village to Granville Island. It’s fun. 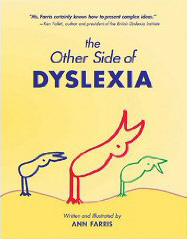 Yes, this blog is usually about dyslexia and hyperlexia but occasionally I am adding other topics. This sequence is describing my Olympic 2010 experience. Day Seven, Tuesday, Feb 16th, 2010. Another full day – now only two things but ……… After a few errands I headed to Northern House (corner of Hastings and Seymour). Peoples of the Northern Territories have transformed an old bank – you know one with high, high ceilings and a few posts to hold the next floor up – into a pavilion. This Pavilion wins my top marks. They organizers gave much thought – so much imagination is oozing out of that space. The entire space has a natural feel. Northern artists – different ones – were engaged to create poster art for the columns. They are splendid! And, the environment brings out the artist in us – the visitor. 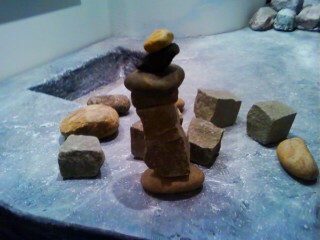 On a table are stones, stones from their land. We are invited to create sculpture. And, athletes are present showing us some of the competitive games they play. They are mostly feats of strength like hanging by your wrists on a pole as you are carried around the stage or the head to head pull – a strap around two person’s heads and they pull. It’s fascinating to watch. No, I didn’t try but many children and adults did. And, they have beautiful art, simply displayed – including hand made clothes. Go, you will enjoy. I stayed two hours. Then I caught a bus to the Coliseum for a late afternoon – into the evening of Men’s Figure Skating: Short Program. Well, it was short for the artists but four and a half hours for us. Now, I am not complaining, I loved it but when I looked at my watch and it was 9 pm, I went wow. Time has flown by. I am glad to have seen the skating before the elimination. We saw thirty skaters – only 20 move on to the final competition tomorrow. We didn’t see the list of who made it into the finals but there were some very young skaters who did wonderful work. They were just not in the league with the stars. The stars, Russian, American and Japanese were spectacular. Their choreography was complicated, their skill amazing, their music appropriate. They deserved being the top three. What saddened me the most was the tumble. So many of the skaters tumbled. Nerves, I guess. I do have one complaint – nothing to do with the skaters but with the media. Surely to goodness, in this day of heightened technology, some creative technician can come up with a way to film events like this without disturbing 2,000 people. My seat was terrific – except that the media was a boom with a camera that kept jumping up in front of me and blocking my and so many other’s view. This is not the time to penny wise and pound foolish. I feel sure the technology is there. Producers need to put their foot down, stamp it down, and say to the media: this kind of disturbance is unacceptable! Solve it. And, programs. They are non existent at the Olympics. I searched the Coliseum yesterday. I was told there was a souvenir program – couldn’t find it but was also told it said nothing about the skating athletes. I, for one, like to know! All there was, was a piece of paper scotch taped to the wall at the entrance that gave the list of when the skaters were performing Same things goes for the Cultural Olympiad. So little information about the work and the artists. I felt sad about that. Yes, I know it is green not to have programs with a decent amount of information but…………..If this is a harbinger for the future I feel sad for future audiences. By the way – here’s the current solution to the Robson Bus. It is cancelled until March 1st. They have created a downtown bus which goes up Georgia, down Pender to Homer loops around to Richards, up Richards to Davie, down Davie to Denman and then repeat. So, all of you coming and staying in the West End, be prepared. There are lots of buses, the route is just different. And, someone needs to give these bus drivers a huge pat on the back. It is amazing how good their cheer is. Tonight coming back – 10:30 ish – downtown was jumping. An amazing amount of action on Davie. The party continues. By the way, I see posters all over town for Nixon in China: It’ an opera by John Adams a much respected contemporary composer being produced by the Vancouver Opera. If you still have a few pennies in your pocket – go – it’s in mid-March. This blog usually focusses on dyslexia and hyperlexia but I thought it would be fun to add my experience at the 2010 Olympics and Culural Olympiad. This is day six, Monday, Feb 15th, 2010. Today, I joined my nephew, Jason, his wife, Sarah and their energetic and curious kids, Jane (age 11) and Owen (age 9) and off we went exploring. First Stop: Code 1. Another digital location – this time Great Northern Way – a humoungous warehouse that is draped in blacks to create many large spaces for digital installations of all sorts. It began with us wandering through a series of hanging plants which when you touch them make noise. The four of us had quite a cacophony of sounds going. That was a great beginning – it gave the kids the sense of – hey, anything goes here and they were off and exploring. And, so were we. The kid in us had a great time. In one room were “ Condemned Bulbes” yes, that’s how it was spelled!! – large, like a foot tall and 8 inches in diameter incandescent blubs hanging shoulder height. It was quite a beautiful, peaceful sight until we began wandering through them and they began to make sounds back at us. At first we thought movement was important so we began rushing the space – then Jane said: stop!.. We stopped, different sounds happened and so it went. Great fun. At one point we entered a room where the kids were invited to put on a cloak with many buttons. Then, they ran up and down this forty foot space which caused the huge pictures on three large screens to change – from the Parliament Buildings in Ottawa – to a pyramid – etc. There was one magic button on this cloak. Push it, and the world exploded on three screens – that caused much merriment. Owen’s favorite exhibit was Papparazzi; a camera followed you, just like those insidious paparazzi – and your picture was constantly imaged on a large screen. And, so it went. We were there an hour and half exploring. A wonderful time had by all. And, as I muse on the experience now, I am wondering, are digital artists only interested in the interactive – is that how they measure their satisfaction with their creativity? On to the Russian Pavilion. We were traveling in Jason and Sarah’s car. The question was: Where to park? Parking is non existent these days. Can you believe, we turned down a side street off Main, turned right again, by the old CNR railroad station and there was one block one with one parking space and no signs that said we couldn’t. NONE. We blessed Mother Kabrini, Katherine’s patron saint of parking, and headed off for Science World, you know that huge dome at the end of False Creek. Currently it has been taken over by the Russians. As we waited a few minutes to enter, we looked across False Creek at the four huge apartment blocks that make up the Olympic Village for the contestants to discover they are draped with the flags of each country participating – a wonderful sight. The Russians have gone all out. All, and I mean all, of the Science World Exhibits are gone. The place has been painted a warm white and Sochi, a tiny town on the Black Sea is the feature. This city will be the host for the 2014 Winter Olympics. It seems this city has a very warm climate – 60 degrees – in winter. (sorry, I have no idea what that is in centigrade). And, it’s a tiny town, much smaller than Victoria. There are many screens and wall pictures showing this tiny town and the mountains an hour away. It seems it gets colder than Whistler! Must be a fast descent. At the moment, Sochi is busy building a railroad which will have a solar and electric train running, taking all the visitors up. That is not all they are about to construct. They have to build several huge arenas to handle hockey, ice skating, etc. Vancouver thought they had a lot of construction to undertake. Nothing like Sochi: Nothing exists yet. Jason, Sarah and I had a chuckle when we discovered who were these young Russians decked out in black suits with white hats. They work for the railroad! It was hard to see what their job was here as they headed for the room with computers, went on-line – we guessed sending an e-mail home. At that point we were being entertained by six women in traditional colorful costumes with lovely voices dancing their way around the temporary stage. I suddenly thought I would love to go to Sochi and said: Hey Jane how about you and I volunteer for Sochi – it could be fun. She’s not to sure. We’ll see when we get closer. We headed on – to other pavilions – there was a huge line to get into Saskatchewan pavilion – we continued on, went into Quebec – it’s nothing, we continued on to Ontario: They have a six minute film – but at least a half hour wait so we decided to check out their “common” space. Large screens allowing us to see some of the sports activity on Whistler and women’s hockey in Vancouver. 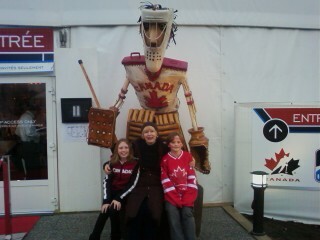 We were close to BC Place. I ran to see if I could get a ticket to the Medals – no go. Sarah kept saying, you are taking my ticket – we have tickets for another medals night and are going again, I will get to see it. So, that’s what I did. But first we had to eat. Not much around so we headed to Tinsletown and a Chinese restaurant. A strange building with a huge movie complex and no people activity at all. The dinner was delicious. Back to BC Place for the ceremony. I must say I was grateful to Sarah. I loved being in the space, feeling it. To warm us up for the ceremony there was a French Canadian group – good solid entertainment – almost folk like. Then, it was ceremony time. The energy of all 20,000 people was throbbing. They were going to see the first Canadian Gold Medal winner. He got a heroes welcome. And, when it was time to sing O Canada the place rocked. Finally they played the anthem as it was written – not like the opening ceremony. That romantic version drove me nuts!!!!! I, of course, got caught up in the lighting technology. So many different tools – vertical lights, streaming thin lines of different colors into the audience, the moving lights wafting back and forth in different colors, the “movies” playing behind the action. All this action, in itself, creates an ambiance that says, it’s exciting. I was really surprised that the flags which are raised as the gold medal winner’s anthem is played are not reaching as high into the space as I thought. On TV – which is the only way I have seen it before, it always seemed to me to be stretching way up into space. Not so. Maybe 30 feet. That’s not much. Hmmmm. Then we watched the medal ceremony in Whistler. I had passed that location just a few days ago – now it was jammed with swaying people in colorful outfits and with flags of many countries being waved. It didn’t matter that the sound didn’t work, at first. Yes, it was perplexing but eventually It corrected itself – or rather technicians rushing about probably corrected it. 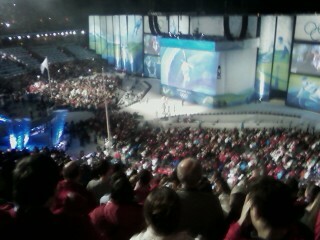 A rock band took over as the ceremony concluded. Not long after the kids were done – We had been going eight hours and they had been troupers. So we headed off into the night. I bid fond farewell. They headed for buses and home. I am grateful to Sarah. When I go home and see a medal ceremony I will know the truth of how it’s produced. I like that. I headed for Live City – thought I might be able to get in. I suppose I could of but it would have been an hour and half wait and the rain was starting. So I ventured off to find a bus. By the way, Sue did say yesterday that they now are handling 10,000 a night. There’s no question Live City is a huge success. Returning to Katherine’s was a giggle. To explain. The crowd around Robson Square keeps getting larger and larger – spilling down Robson toward Stanley Park making bus travel on Robson nearly impossible. Last night I couldn’t find a bus coming down Robson at Burrard. It was almost midnight. I asked a policemen. He said: They are rerooted. Go to Davie. I hopped a bus to Davie. No luck there, so I jumped in a cab. So, tonight I wondered what will happen. Success, I found a Davie bus and we went down Davie to English Bay. I jumped off, and went to the bus in front which I expected would continue down Denman to Robson and go up Robson. I said to the driver: Are you going down Denman? Yes. I got on. Then the bus driver from the one I had just exited got on to talk to my bus driver. Okay, that’s what we are going to do. We left. I exited before the bus turned on Robson. I will see tomorrow what is up. What is delightful is that somehow it all works and everyone is just going with the flow having a good time. And, these bus drivers don’t seemed hassled at all. In fact, our driver said, it’s fun, adds to the merriment of the experience. (He’s very British with a distinct Brit accent). Before I forget it each day I am sending these e-mails from a coffee house, MUM’S on the corner of Denman and Haro. If you are in the neighborhood, drop by. They make all the muffins, breads, etc daily in their kitchen and they are DIVINE. Fresh, large – I know, not good for the waist – but what the heck, they are delicious!! !